The Palestinians Prisoners’ Society (PPS) has reported that Israeli soldiers abducted, earlier Monday, twenty-three Palestinians, including one woman, after invading and violently searching their homes, in different parts of the occupied West Bank, including Jerusalem. The PPS office in Tulkarem governorate, in northern West Bank, said the soldiers abducted nine Palestinians, identified as Mahfouth Abu ‘Aisha, Mo’tasem Abu Laila, Mo’men Da’ma, Mohammad Nidal ‘Aref, As’ad Saffouri, Ehab al-‘Ajouz, Ali Shehada, Moath Raddad and Montaser Majdouba. In Jenin governorate, in northern West Bank, the soldiers abducted Yousef Abu as-Seba’ and Ahmad Jad’oun. In Nablus, also in northern West Bank, the soldiers abducted two Palestinians, identified as Daoud ‘Awni Jawareesh, 20, and Khaled Abdul-Qader Sharqawi, 17. 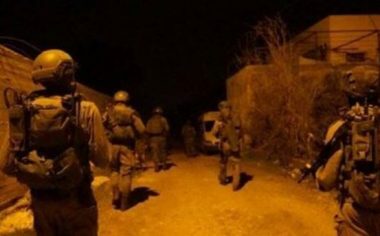 In Salfit, in northeastern West Bank, searched many homes, and abducted Adham Haitham Sobeh, 23, his brother Ahmad, 20, and Soheib Ibrahim Bakr, 22. In Jerusalem, the soldiers abducted a woman, identified as Amaal Abu Sneina, 40, and two young men, Badawi Abu ‘Assab and Rasheed ar-Resheq. In Ramallah governorate, in central West Bank, the soldiers abducted Omar Hamed and Hasan Khader Zahran. In Hebron, in the southern part of the West Bank, the soldiers abducted four university students, identified as ‘Odai Sa’adi Ekhlayyel, 20, Ghazi Farooq Masalma, Bilal Jihad ‘Amro and Mahmoud Mohammad Abu Salama.